The pond I built in my backyard enjoyed a good run. Fifteen years. But in the end, the raccoons won. The pond is no more. So it is with nature in the big city. The grief is almost gone. But it lingers. Let me explain. Over the years, my backyard garden has mirrored the evolution in my ecological understanding. 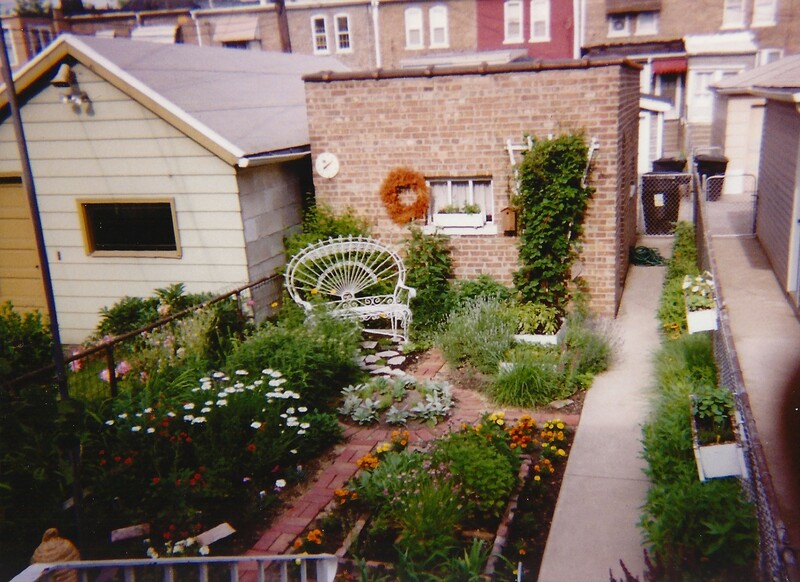 When I moved into my historic Pullman worker’s cottage more than twenty years ago, the postage stamp-sized backyard was well-tended turfgrass bordered by a few day lilies, a couple of hostas, a spindly rose bush and a very healthy clematis. I’d never owned a home before, never really gardened. But for some reason I really wanted a garden, a little patch of land I could work and call my own. My own little Eden. Before I’d finished unpacking boxes in the house, I dug up all the grass. I installed a geometric pattern of brick pathways and filled the resulting quadrants with a mix of annuals and perennials, selected from whatever they had at the local home improvement store. I added an antique bird bath and accented the whole shebang with a couple of old washtubs-turned-planters filled with herbs. That same year, 1996, marked the establishment of Midewin National Tallgrass Prairie. At the time, I didn’t know much about nature and restoration. But the idea of returning the former Joliet Arsenal back into the 20,000-acre prairie garden it used to be appealed to me. A big patch of land. Eden writ large. So, I volunteered. I helped establish Midewin’s very first native prairie plant seedbeds, which help supply the seed stock for the massive restoration effort. I think it may have been this experience that planted the seed in my mind to add a few prairie plants to my postage stamp-sized backyard. I started with a native seed bomb, a packet of various kinds of seeds handed out at some event I’d attended. I sowed the seed in a concrete-lined border bed that ran from the backdoor to the alley. My prairie restoration measured six inches by twenty-five feet—.0002869605 of an acre—teeming with common milkweed, little bluestem, cone flowers, coreopsis, and black-eyed Susans. Over the years, from what I learned and experienced at Midewin, I began adding more and more native plants to my overall backyard garden design. Living in historic Pullman, you can’t help but be curious about its rich, multi-faceted history as “the most perfect town in the world.” I was intrigued to learn that the land upon which it was built originally was marsh and wet prairie along the shores of Lake Calumet, famed for its rich abundance of native plants and animals. I dug five feet down until I hit clay—the lake bed of ancient Lake Chicago, the precursor to Lake Michigan. I sculpted within the hole a terrace to hold potted pond plants. I curved the edges to give the pond a natural feel. I installed the rubber lining. I rimmed the pond with sandstone slabs. I rigged an antique water pump. I added plants. I added water. It took a few years for the pond to achieve its own biochemistry equilibrium. Through a lot of trial and error with different treatments, finally its waters cleared. The pet store turtles thrived. Scores of dragonflies found the pond on their own. 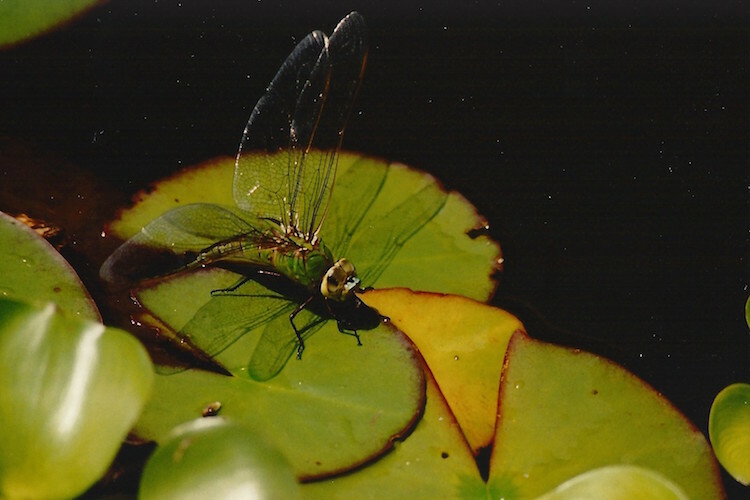 I would spend hours watching them hover and hunt for insects, and land on lily pads, and curl their ovipositors to lay their eggs on the underside of the leaves. Cleaning the pond, I would thrill to discover dragonfly larva and look forward to watching them emerge up the stalks of bulrushes, there to shed their final shell, unfurl their wings, and lift off to hover and hunt and lay their eggs. The circle of life. Back to the raccoons. Many of my Pullman neighbors have garden ponds in their backyards. Occasionally, someone will mention a missing fish or bemoan unsightly droppings. But by and large, those of us with ponds and gardens live in harmony with our urban wildlife. Until last year. A large family of raccoons discovered my pond. More than a nuisance, they turned marauders. They crushed all the plants. They knocked the pond rim stones into the water. They chewed through the pump hoses. They ate every living pond creature they could find. I tried various fixes and deterrents. I repaired. They destroyed again. I confess, my thoughts turned murderous. And not for the first time. Several years earlier, my house was plagued by squirrels in the attic. I trapped countless squirrels with a Have-a-Heart trap and released them into distant forest preserves, only to have new squirrels chew through the repaired eaves and take up residence again. Learning that it is both unethical and illegal to trap and relocate squirrels, I considered killing them instead. Also illegal, but bear with me a moment. My thinking ran along these lines. I know that Midewin and many other restoration sites suffer from an overabundance of white-tailed deer. That we—people—have created the circumstances for this overabundance. And that to maintain a healthy balance of healthy plants and healthy animals in our natural lands, it is a common best practice to cull deer. To kill them. So. Rather than relocate my squirrel problem, I considered if I should do the right thing, do the hard thing, and take it upon myself to eliminate my squirrel problem. Even if I were to hire an exterminator, not only is this expensive, but this, too, would only shift the responsibility for killing them to someone else. So, I read up on the most humane ways to put squirrels down and was surprised to learn that drowning was among the best solutions. Really? Well. OK. I lured a squirrel to its execution with a little peanut butter. I filled a big bucket with water. I held the caged animal over the bucket. I can’t recall how much Aldo Leopold’s essay “Thinking Like a Mountain” may have influenced my decision. I don’t remember if I considered what it would be like to watch the squirrel’s beady little eyes go dead, just as a youthful Leopold had observed the green fire go out in the eyes of a wolf he’d just shot. But to this day, I can imagine what it would have felt like holding the cage under water as the squirrel violently tried to escape. Until the water went still, and I had solved—fleetingly—one kind of problem, while leaving entirely unanswered the larger question of how to achieve balance—moral, ethical, ecological—in my little backyard. In the world. I let the squirrel go, right there in the backyard. I fixed the holes in the eaves yet again. But better. Knock wood, but I haven’t had squirrels in the attic for years. When the raccoons destroyed my pond, I confess I once again considered all of my options. In the end, following the consensus advice available, there was only one right decision: get rid of the thing that attracts them. For most people, that means putting tight-fitting lids on garbage cans or not leaving pet food outside. For me, it meant getting rid of the pond. However, the right decision didn’t mean that it was an easy decision. I delayed doing anything. I let the desecrated pond just sit there for a year, no plants, no working pump, a shamble of stones and stagnant water. Eden violated. It might have been another bout of writer’s block that finally compelled me to action. I pumped out the water. I removed the sandstone slabs. I dismantled the plumbing. I sliced up the liner and removed it, leaving behind the rich, accumulated pond muck, turning a blind eye to the remaining dragonfly larvae, wriggling naked and exposed. I bought a truckload of dirt. Bucket by bucket, I filled in the pond. When done, the mounded earth resembled nothing so much as a grave. Fitting, I suppose, for it felt as if I had buried a little part of Eden. Even though my motivation may have been different, the net effect of my actions was like so many before me. Like George Pullman who filled in the wetlands to build his model town. Like generations of pioneers and farmers who filled in, drained, and plowed up nearly every square inch of Illinois, destroying 99.9% of the Prairie State’s original prairie lands. In place of the pond, I built a cement block cistern, anchored with four-foot lengths of rebar and topped with an iron grate, atop which I bolted the antique iron water pump. Squirrels and house sparrows sip from the water splashes. As do, I imagine, raccoons. Though if they can destroy this as they did the pond, they can have the entire house. All in all, the new water feature fits right in. The native plants surrounding it flourish. The garden looks lovely. Still, I miss the dragonflies. For them, I head out to the recovering prairie lands of Midewin. Arthur Melville Pearson is director of the Chicago Region Program for the Gaylord and Dorothy Donnelley Foundation. As an active volunteer at Midewin National Tallgrass Prairie, Arthur chronicles his restoration experiences in A Midewin Almanac at midewinrestoration.net. He is also the author of the recently published Force of Nature, a biography of George Fell, the driving force behind the founding of The Nature Conservancy and the entire Natural Areas Movement.